A fairly tough start to the season with plenty of good conferring material. "The quiz itself was well received. Good old traditional matched pairs and no notable gimmicks." As ever Dave and his colleagues served up a beautifully crafted paper. "Hard but interesting" was the collective Albert/Pigs verdict. "A hard paper with 20 unanswered questions. The redeeming feature (as always) was that even the hard questions were interesting." "Good paper again from the Hangmen although we couldn't help but wonder which of the setters has the obscure metallic ore fetish." Pretty tough was the overall verdict with 23 unanswered questions at the Griffin and 24 at the Fletcher Moss. "Theme rounds were well thought out with confounders in abundance." "We all feel we deserve a slightly easier ride next week!!" "A good set of questions despite a few dodgy 'nul point' pairs (in particular on the subject of Speedway)." "We liked pretty much all of it and we're big fans of the 'Pick your own subject' format." "Tonight's questions were a bit of a hodgepodge." "Quiz itself quite tricky with 19 unanswerables. I do think this year has been the hardest in the 10 years we have been in the league." "Best of the season so far." "We thought this was a good, straightforward quiz of the old-fashioned type with no fancy frills or esoteric subject matter." "A good 'straight down the middle' WithQuiz paper." "Yep, the technical term Fr Megson used to describe the quiz was 'Goldilocks' - not too hard, not too easy, just right. Perfect in fact." By general consent it was tough. "Quiz itself undeniably fair, if impossible: e.g. German leaders’ aphorisms. However the level of difficulty does blunt one’s appreciation of the care that went into the construction and execution of themes and overall question balancing." The diverse styles of the rounds and the number of 'well I never' questions meant that we had plenty of candidates for Question of the Week. My own favourite moment was going for the TAGTOTAG question and singing the answer spot on. "The best paper of the season so far by miles providing plenty of head scratchers and tip of the tongue moments." 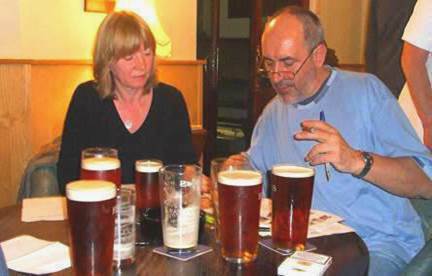 "Just a note to say we thought last night’s quiz was lovely, well-crafted, balanced and fun. Big congrats to Brian for putting it together." "Excellent Opsimaths paper. Loads of points on offer and a pretty close game until the last couple of rounds. All done and dusted in an hour and a half which is always a good sign." "We kind of enjoyed the Prods paper although we find the obscurity of all those damned hidden themes a bit of a trial." "Very decent Prodigals paper with very few unanswered on either side." Brilliant! I can't imagine a better advertisement for the way the question-setting in our league has advanced over the years. "Dave is to be congratulated on a very searching, interesting and pleasing quiz." It's getting rather boring saying "what a good paper it was this week". So I won't. But it was. "We enjoyed the quiz very much and think that the Historymen should be charged with setting it every week." "Hard from the Bards" was the general verdict. "Quiz itself was a curate’s egg and fairly hard. We quite liked the penalty missers and the literary rounds." "Oh dear! Oh dear! If Bamber and Magnus had compiled a checklist of errors to commit when setting a quiz paper then the Bards would have checked quite a few." The phrase 'work of art' has crossed a few lips when summing up. Dave's efforts and tonight's chef d'oeuvre was no exception. Lengthy - yes. Boring - certainly not. This was a paper that kept you enthralled right up to the final theme penny-dropping half way through Round 8. "The questions were beautifully crafted and embossed with throwaway facts like diamonds on a Faberge egg - for instance Rembrandt painted himself in a boat as an extra apostle." The Students set an extremely enjoyable quiz. Nobody had any adverse comments to make. "Both teams enjoyed the CMR questions. It was good to have a fair sprinkling of science and medical questions." Well, what a paper!! I don't know about you but at the Club we were busy right up to 11pm trying to disinter themes, arguing as to why the well known Glenridding terrier wasn't the answer in Round 4 and trying to work out why an American film star would want to be called Debra Whinger (thanks, Jitka!). It was hard work. "Opinion on the quiz was mixed." "...it was described as 'challenging'." "The Charas and Meat Raffle were pretty OK with the questions in general but the Charas, with only one driver on their team, do dread the thought of Motorway Services questions." No complaints and plenty of delight all round. Themes on Scottish islands and Test Match venues played right into my interest zone - so many thanks Kieran. "We all felt the quiz was a good 'un. A fair cross section of musical questions, from Sister Rosetta Tharpe through Glam Rock, Prog Rock, and Punk to Gabba Gabba Hey Hey." "Great themes and a general tip-of-the-tonguery that made for a most enjoyable evening." "Although the quiz was hard there were lots of interesting teasers." "A great quiz with lots of twists and turns and some very clever trickery. Really loved the tic-tac round." This was a just wonderful evening's entertainment crafted by real experts. It was hard to think it could get better by the time we got to the end of Round 6 and then it just did. The final 2 Bingo Blockbuster rounds were a master-class in the art of question-setting. "We found the quiz to be a nice, flowing and relaxing effort." "The paper contained many relatively easy questions but this created a very different pressure from a difficult paper. It was hard not to feel disappointed if you didn't get a two." A paper packed full of variety and invention: themed rounds, 'pick your own subject' rounds, paired rounds, a round of questions linked to WithQuiz team names where you could pick your own team, and then, to cap it all, a paired and themed picture round. "Well certainly the antidote to last week's unrestrained 'shoot on sight frolic' - and not in a good way." "The first round proved to be hard going for both teams though things speeded up to Electric Pigs pace thereafter." "The Historymen's questions were a nice, bouncy, assortment of anything you might fancy that proceeded at a fairly brisk pace." A great paper as far as we were concerned. Kieran thought it pretty good - but was a bit disgruntled at the 'link' in Round 3. This was not an easy paper with a reported 19 unanswered questions from the Ethel/Charabancs match but it did have plenty of inventive material and gave some great close finishes. "We thought the Bards' questions were a genial melange of this and that with a pronounced emphasis on literature which may have been instrumental in giving us the edge." A good, strong, traditional quiz paper with no fancy themes or trickery. Not a paper to fill your boots with easy points, nor indeed to inspire much affection but still fair enough. "Very good evening on an enjoyable Charas paper with plenty of opportunities to score points and try to work out where the themes were coming from." This was an excellent paper with which to end the WithQuiz competitive season. "A great quiz marred only by describing Lichfield as a town, not a city, which cost us a point." It was clear what a good job the Fairies had done from the praise heaped on the paper.